Aroid Forum: What the heck is going on here? If you know, please clue me in. > Subject: [Aroid-l] What the heck is going on here? Nice mystery! Try removing one or two of these structures and, using a strong hand lense, dissect them carefully using an exacto knife. Try to determine what their origin may be, if they may mutated flowers, or maybe mutated fruit/ seeds? Have you sprayed any hormone liquids near to this plant?? Is it a newly purchased specimen?? If you can find no answer when you dissect, I`d place the whole spadix in alcohol and see if Tom Croat or any other taxonomist wants to or will take a look and try to determine the origin of these abnormal structures. 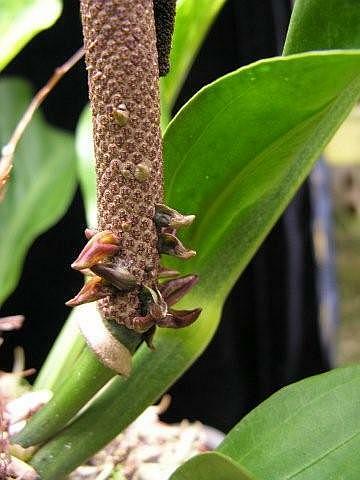 They may just be an artifact of a hybrid birds nest-type Anthurium. Maybe Denis or Bill Rotalante has seen these on other plants?? > If you know, please clue me in. > Note: To protect against computer viruses, e-mail programs may prevent sending or receiving certain types of file attachments. Check your e-mail security settings to determine how attachments are handled. For me it looks like a step back in evolution. It may be a very precious photo. Can you take a closeup of this phenomenon, cos it looks like this anthurium formed a petal instead of a tepal and a distinct pistil. Subject: [Aroid-l] What the heck is going on here? Are those the flowers starting? Very interesting. Looks like flower buds maybe. see what looks to be at least one of the seeds. generally do from the spadix structure. >If you know, please clue me in. No, I don't use hormones on any of our plants. older ones. Their is no seed capsule present. are it is a TC. inflorescences in alcohol and send it on. everyone can take a good look at it too. What fun these plants are! Subject: Re: [Aroid-l] What the heck is going on here? >> Subject: [Aroid-l] What the heck is going on here? > a look and try to determine the origin of these abnormal structures. > They may just be an artifact of a hybrid birds nest-type Anthurium. > Maybe Denis or Bill Rotalante has seen these on other plants?? >> If you know, please clue me in. >> e-mail security settings to determine how attachments are handled.